Why check out the maternity section? Hmmm? Oh, this will be SO bad for my bank account… how exciting! 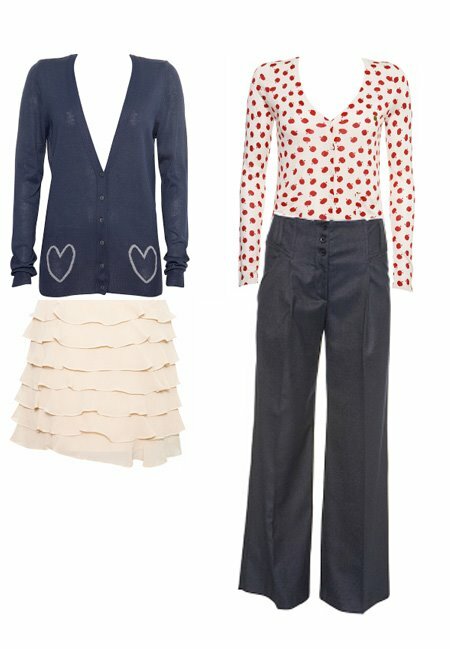 I would TOTALLY wear both those looks! BOOYAH! I dont know why it took all this time for it to open up in the States. We’ve had Topshop in Kuwait for almost 5 years now. hey..check it out.. i just threw a party..think you should check it out..
don’t be surprised if you see some of your ideas!! i love you and your style. Hooray! I am so excited! Thanks! Oh, and your blog is fabulous! topshop has been shipping to the US since last year at least. They have great maternity jeans. This is the best news ever! I live near Soho and walk by the soon-to-be Top Shop store everyday, hoping it will open in October, but an online shop is the next best thing! Thanks! that outfit on the left is SOOOO cute!! I remember shopping there in London years ago and it seemed so cheap – damn that exchange rate of ours! the baby stuff is so cute! i wonder if their little deer shirt is OK for boys…. I was a missionary in the UK about a decade ago and LOVED spending time and money at H&M and Topshop. Hurrah that they are both here now…. French are also coming ! Hie,i’m happy to have discovered your website form Tangled and true. My website offers a selection of wooden toys built to last, french books, accessories and a collection of wall decals and accessories. From the retro bohemian style to the Parisian chic atmosphere, french designers for kids have found their place on Comptoir d’enfance. i just made my first purchase this morning! please check out my blog since i have a code for free shipping you should share with your readers! love your site, btw…would you like to trade links? i walked by the unfinished store in SoHo last week and felt so sad that it wasn’t open yet. THIS is good to know though. That’s excting…now if only they would make it to Canada!